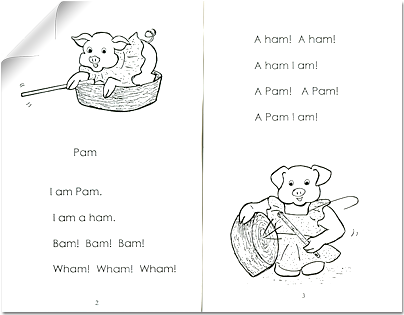 Early Reading made fun and easy! 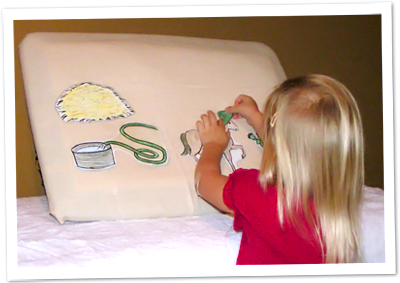 ABC Discovery Kindergarten Curriculum combines systematic phonics with hands-on learning activities that are easy to teach and fun for everyone. 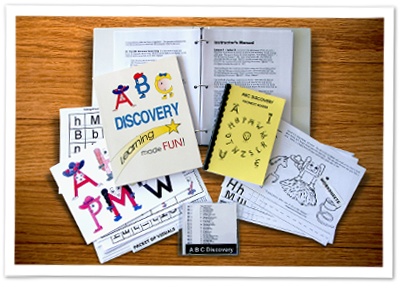 The ABC Discovery Kindergarten Curriculum includes the book, ABC Discovery (a full color 119 page book), downloadable music, an Instructor’s Manual*, Worksheets and Visuals for hands-on learning (to be used as copy masters), and a Phonetic Reader. *The Manual includes a Workshop that provides the instructor with information that is useful in the teaching of reading. NOTE: Click here to scroll down to videos showing these materials being used in a group of children at the bottom of this page. 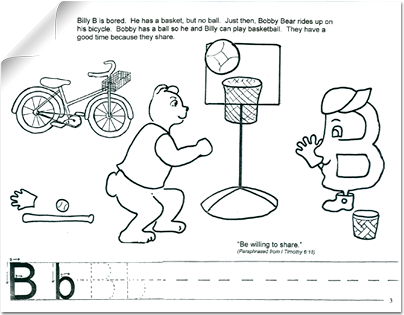 The instructor uses the Letter Friend as a puppet and pretends it is greeting the child, as seen below in the blurb. 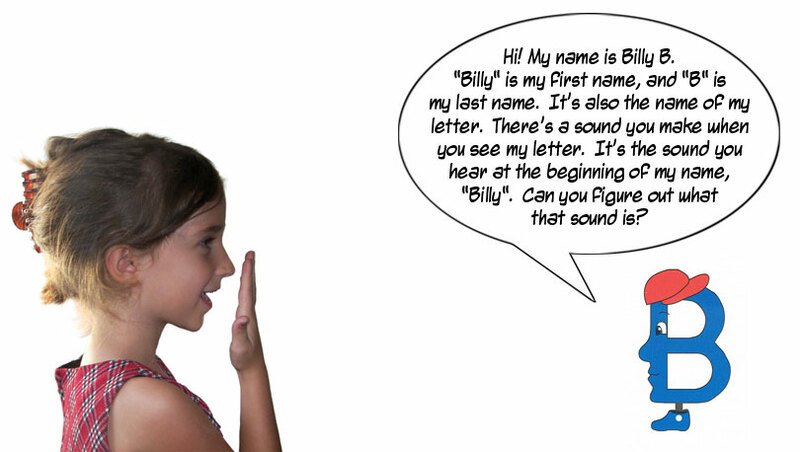 The question-answer method is used to make the child aware of the way the letter sound is made. The child ‘examines’ each letter sound by placing her hand in front of her lips to feel the air – and on her throat to feel the vibration that accompanies the letter sound. This helps to strengthen the connection between the letter sound and the letter symbol. *Cartoon character “Puff” represents the air, i.e., the breath, that carries out letter sounds. 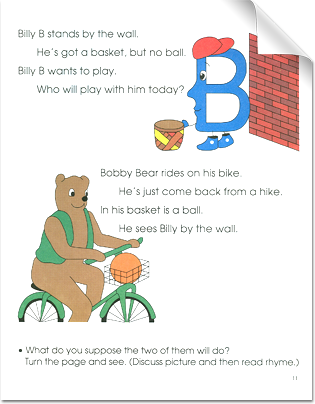 The teacher reads the rhyme for that letter from ABC Discovery and the child picks out the objects that begin with the letter sound. The child may use “Sticks ‘n Circles” to learn letter shape and stroke order. 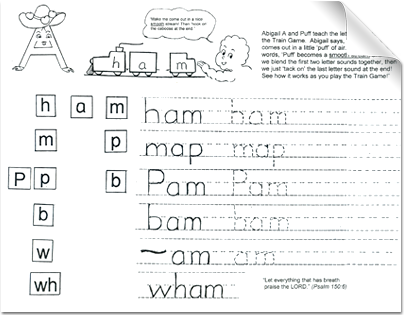 A worksheet for each letter provides opportunity for the child to practice writing the letter and review letter sounds while coloring the pictures. Item 004 on the ‘Store Page’. Key Pictures and Manuscript Letters are cards that may be used to play “memory match” and other learning games. In addition to reading and writing, the Kindergarten Curriculum includes suggestions for teaching counting and numbers, positional concepts, general knowledge, shapes, ideas for crafts and suggestions of stories that may be read to the child. To maintain the interest of the child, most of these are presented as having some kind of connection to the ABC Discovery rhyme and/or the character-building concept. 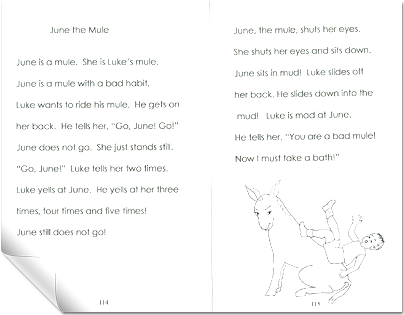 The character-building discussion guide, called “Lesson in Living”, and the suggested Bible verses or stories and motivational songs are also related to the rhyme. After just a few consonants and one vowel have been learned, Consonant-Vowel (CV) blending is introduced. This foundational skill can be reinforced through using some of the recommended physical learning activities. 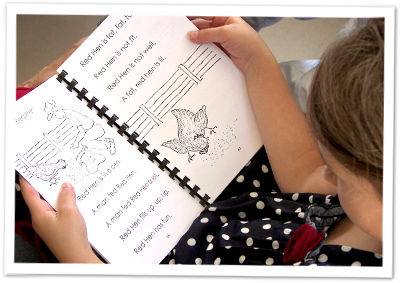 In this lesson, the child begins to experience the fun of actual reading. A final consonant is added, making three-letter Consonant-Vowel-Consonant words. 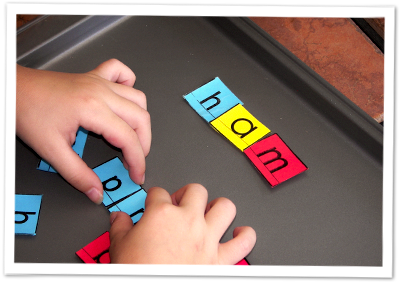 (CVC) The child sounds these out while manipulating magnetized letter cards on a metal tray. From this point on, word-building with letter cards, writing on the worksheet and reading are included in each lesson. 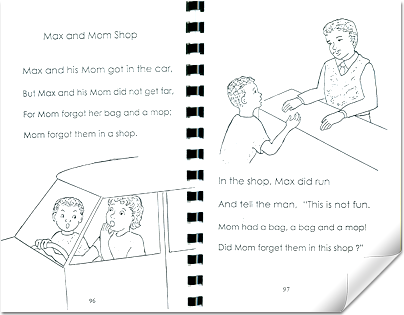 In the final step of each lesson, the child meets the same words, now arranged as a story in the Phonetic Reader. Consonants are added, one per lesson, whereas vowels are followed by several lessons. This provides ample practice in differentiating between vowel sounds. The last lesson in the CVC section presents words with a-r, e-r, and o-r blends. After the foundational phonetic pattern (CVC) has been introduced and thoroughly practiced, the long-vowel phonetic patterns, CV and CVC+ e, and y as a vowel are introduced. By the end of the Kindergarten program, the child will be equipped to attack words at the foundational level and will be able to enjoy a variety of other stories. 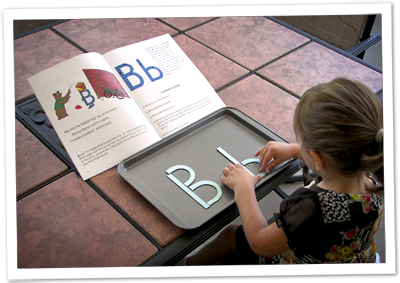 The next and final steps in the ABC Discovery program are the two Phonics/Spelling Workbooks, “Discovery Trail” and “Fun with Letter Friends”. Younger children learn letter shape by using Sticks ‘n Circles. The final activity is “Bunny Hop”. The five vowels have been lined up on the floor. 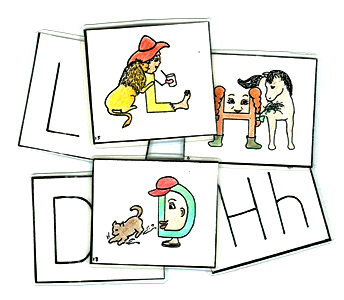 Children hold a card on which an initial and final consonant have been written; an empty space is left between the consonant letters. As the children hop, they position the empty space over the vowels and read the words that appear. Click Here to read testimonials from the Parents of the Children in the Video.